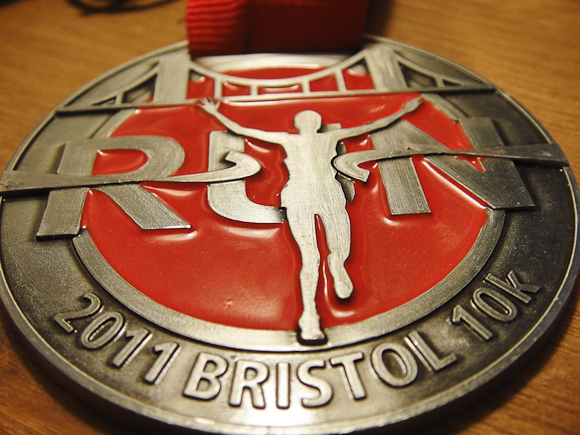 The Bristol 10K was my first race, this time last year. It’s a good, fun race, with a whole lot of people — 9,000 finished this year — and it’s right on my doorstep. It only takes me twenty minutes to get to the start line, and then we run right back past my flat and run out along the Portway, my default jogging route. Running solo, and having done two half‐marathons in the meantime, the race felt quite different from last year. For a start, I wasn’t the least bit nervous. 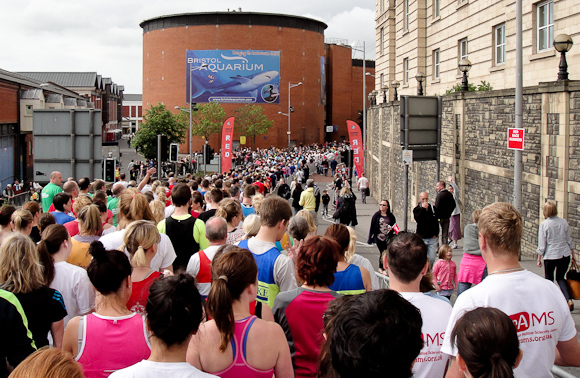 Once you’ve done 21K a couple of times, a 10K is distinctly less intimidating. It felt significantly easier, in fact, all the way around. I kept up a very steady pace, except for putting on a bit of speed here a couple of times to see what it felt like (not that sustainable, sadly!) And I just kept going, knowing I had plenty of distance in reserve, and enjoying the atmosphere. And the costumes. The team (I’m guessing husband and wife) who jogged past as policeman and convict, joined with handcuffs; the “three amigos” with their sombreros and inflatable horses (mules? ); the breasts bobbing along for breast cancer, and the Royal Engineers (I think), in uniform rather than costume, who did it with big heavy packs on. Crazy people. On the downside, I don’t know whether it was lack of speed practice, lack of a running partner, or just the extra weight I’m carrying this time around, I came in at 01:11:15, which is 1 minute 47 slower than last year’s time. Still, that’s just motivation to train a bit harder for next year’s race! On the upside, I’ve raised at least £135 for St. Peter’s Hospice, thanks to some generous donations from lovely people. Work will double that, so that’s a very decent £270 minimum for the hospice. Thank you, most excellent sponsors!